Jeff Abbott is a BookPeople staple. Pretty much as long as he’s been publishing, he’s been coming to our store. 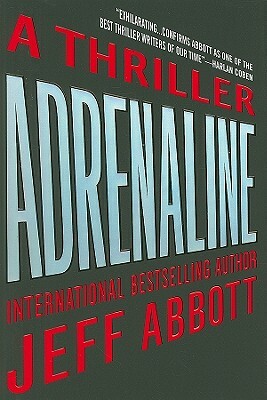 We’re thrilled to see all the great reviews that have been rolling in for his latest thriller, Adrenaline: Entertainment Weekly made it their Pick of the Day for 6/29; our own Austin Chronicle picked it as a summer read; BookPage featured it; The Columbus Dispatch said that it “keeps the intensity at a peak level” and is “worth of its title”; Publisher’s Weekly gave it a starred review and also did a Q&A with Jeff. You should also check out the awesome TV ad publisher Grand Central will be running for Adrenaline. And if you just can’t get enough Abbott, come on down to our cafe at 6p where Jeff will join the Hard Wood Book Club. We’ll be discussing his previous novel, Trust Me. It’s always a good time when Jeff’s around, so don’t miss out, come on down tomorrow, Wednesday June 29th!